Every person who has lived in India in the last 10 years has comes across the term 2G scam and the (questionable) Rs. 1.76 lakh crore that was embezzled by A. Raja. While much of this scam is still shrouded in darkness, with the ugly truth in all possibility never seeing the light of the day, one hopes that someone in authority at least points to what the major mis-happenings with the government was. Vinod Rai in 'Not Just an Accountant' just does that. 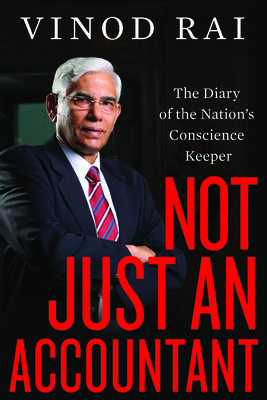 Vinod Rai, a well-known figure to those who watch the news channels religiously, pens down his experience of close to 40 years in which he serves the government in various capacities. He has most recently served as the Comptroller and Auditor General (CAG) of India and was witness to a lot of the happenings in the government from mid 2000s till almost the end of the UPA regime in 2013. Having seen CAG as just an abbreviation in a lot news articles ranging from the Commonwealth games 2010 scam to the coal block allocation case, this book gave a wonderful insight for me into what the office of the CAG actually does. By explaining the duties and tasks of the CAG in common man’s lingo, Mr. Rai sure makes the premise of the book easy to digest in terms of vocabulary. However, the same cannot be said about the premise. For an upper middle-class individual, the magnitude of the scams described in the book, is something that is indeed unpalatable. In the first part of the book aptly titled ‘The Journey’, Mr. Rai starts off with his journey as an IAS officer of the 1972 batch from Nagaland to Kerala to Delhi and more with the shuttles between Kerala and Delhi being of a higher frequency. He throws in instances of what he was able to perform in each of the stints he had in the administration in various capacities. This is followed by a ‘explain to me like I am five’ lesson on ‘The Role of Audit,’ which forms a basis for the the rest of the book. Short descriptions on the ‘Role of Media’ and the CBI in the current state of affairs in India complete this first part. The second part of the book ‘Follies’ (‘Follies of whom?’, I am tempted to ask) majorly deals with the 2G spectrum allocation scam, CWG 2010 scam, coal block allocation scam, Gas explorations and finally the way Air India has operated in the last few years. This, to me, is the most compelling part of the book. While a lot of the material in this regard is public knowledge, Mr. Rai provides an insider’s view at what is seen by the office whose responsibility is to audit the practices of the government. The dark secrets remain dark for the most part, since Mr. Rai refuses to take names in multiple contexts, but what comes tumbling out of the closet is the fact that what we see in newspapers in mostly the tip of the iceberg. Despite his misdoings, particularly in the second UPA region, I remain a fan of Dr. Manmohan Singh, as does Mr. Rai. But the extent to which Mr. Rai goes on to prove that the PMO has sufficient information about each misdealing that have occurred in the last decade makes me empathise with Dr. Singh. A hand-tied puppet, who perhaps with all his foresight could have steered us in a direction of progress, remains tongue-tied too. In the last part of the book ‘Course Correction,’ Mr. Rai quickly goes over what he sure sees in India as a potential superpower settling down for mediocrity. I recently read a book edited by Shashi Tharoor ‘India: the Future is Now,’ which had a collection of essays by the new generation MPs. While each of the essays read like what a high school kid would write, with some imagination all over the place, the book showed that there was still some promise. Mr. Rai, with his final words, just re-emphasises that. A cleansing of the system is necessary. For that, a lot more people should be aware of what goes on in the government. And this book ‘Not Just An Accountant,’ where Mr. Vinod Rai manages to settle his accounts with the ‘barking dogs,’ is a good start.